95 Lawton in 2011. Image: Google Maps, 2011. It was once named The Normandy. Image: Google Maps, 2014. This one is probably better off in the ‘Blog’ section, as so much of the story is in the notes. Nevertheless, because the front hasn’t seen much since February, I’ve put it here. The apartment building at 95 Lawton was constructed through the Fall of 1955 and Winter of 1956. An Independent Real Estate Ltd. project, it was advertised with the distinction as Toronto’s first fully-air conditioned. In addition to the luxury of temperature control in a city with fairly hot summers, it also boasted the amenities, such as wall-to-wall broadloom in the hallways, two elevators, and washrooms with coloured tiles and fixtures.1Toronto Star, April 7, 1956, 35. It was first advertised on an owner-occupied basis as a cooperative apartment (much like a condominium) named the Regal Towers, and with a downpayment of $4,000 to $6,000, one could own a unit.2Toronto Star, January 27, 1956, 29; Toronto Star, February 14, 1956, 38; Toronto Star, February 24, 1956, 44. 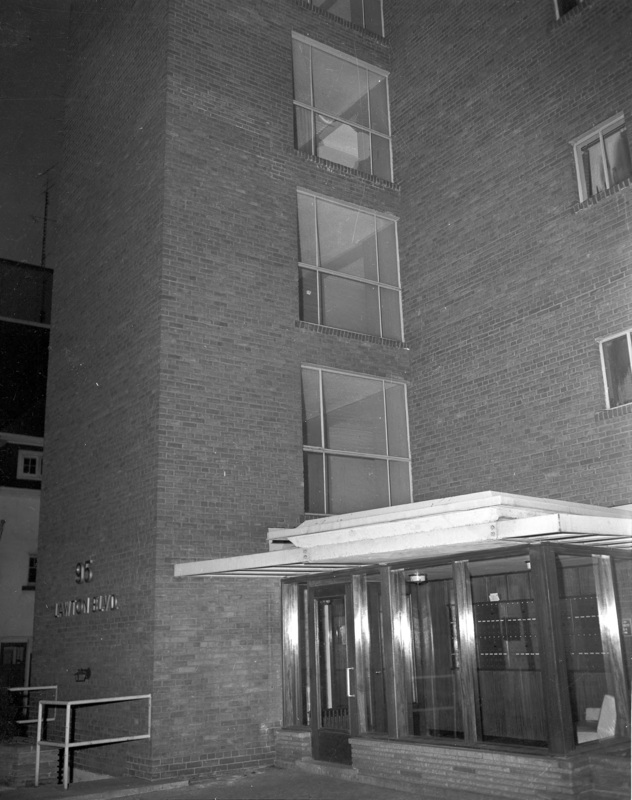 Co-operative apartments were, during the 1950s, a popular way to reconcile the desire for owner-occupied housing with the reality of rapidly increasing property costs. Advertisements for – and discussion surrounding – such cooperative apartments are stunning reminiscent to what surrounds condominiums today. See Globe and Mail, May 21, 1949, 27; “Luxury Planned for Co-operative Apartments,” Globe and Mail, September 27, 1955, 8; “Around Metro,” Globe and Mail, October 20, 1956, 14; “Co-operative Apartments Increase,” Globe and Mail, October 13, 1956, 13; James Knack. 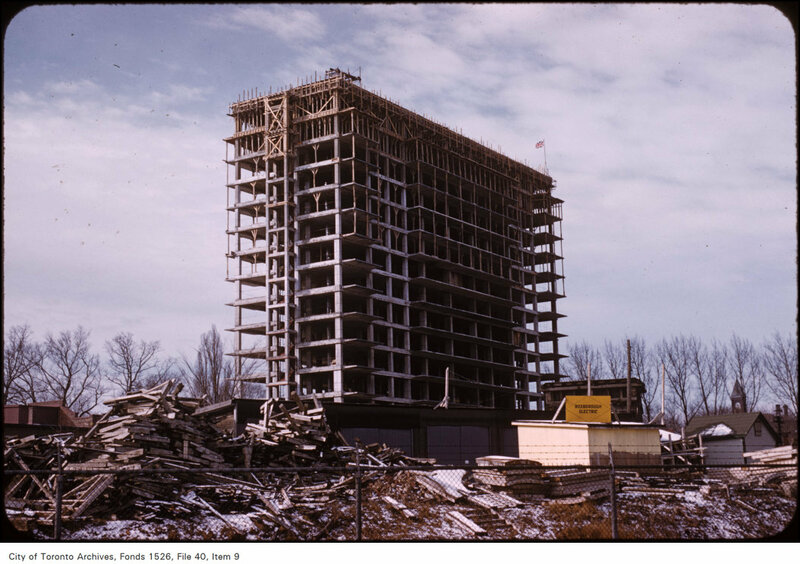 “New Rights in Apartment Use Seen In Co-Operative Housing,” Globe and Mail, July 6, 1957, 12.The first tower condominium constructed in Canada was Horizon House in Nepean. See E.H.Q. Smith. “Old Wine in New Bottles,” Habitat 12, nos. 4-5 (1969): 2-4; John Geisler. “Ontario,” Habitat 12, nos. 4-5 (1969): 6-7. It does not appear to be the case that it remained as such: subsequent advertisements run in the Toronto Star described it as an apartment to rent.3I am, of course, not in Toronto at the moment so do not have ready access to sources with which I can verify. Advertisement for the Regal Towers. Image: Toronto Star, January 27, 1956, 29. The strip in 1953, just as development was picking up. 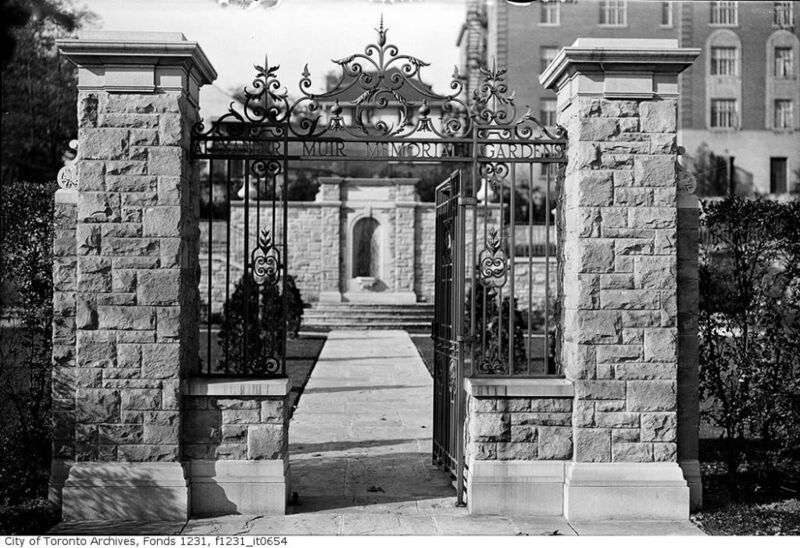 Image: City of Toronto Archives, Series 12, 1953, Item 135. With the arrival of the subway in 1954 development pressures were immense, but not unexpected. Located a very short walk from the Davisville subway yard and station, the shard of land between Lawton and Yonge were ripe for development.4A large enough portion of the shard had been used for the subway line’s open cut and had necessitated the demolition of a number of homes, including what was then the city’s oldest inhabited home located at 89 Lawton. See “Rapid Transit Project Dooms Oldest Building,” Globe and Mail, August 9, 1949, 5. The Alexander Muir Gardens were originally on location as well and were subsequently moved to the current location. 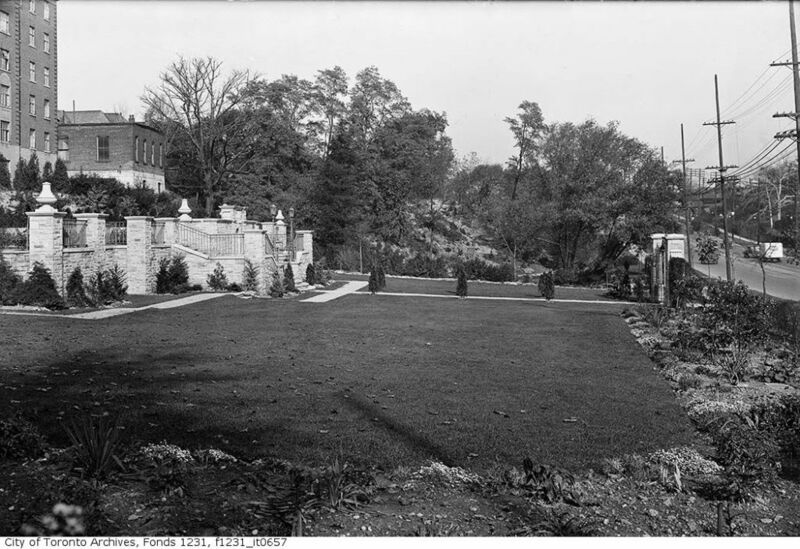 The two images below are dated 1935 and depict the gardens as they appeared before the subway necessitated its movement. Note the presence of 101 Lawton to the left. In fact, the financial success of Canada’s first subway depended greatly on the development of real estate along the Yonge corridor. Although development pressures had been felt in the Deer Park neighbourhood before the subway’s arrival, it was its planning that appears to have catalyzed the neighbourhood. The sale and subsequent expropriation by the Parks Department of the Lawton Loop in 1954 appears to have been one event to sound the alarm.5By 1954, the subway had obviated the need for the Yonge streetcar and its associated facilities, including the Lawton Loop. The TTC proceeded to sell the unnecessary facility to Rosedale Properties, a developer who planned to erect a seven-storey office building. Community outcry, as was the case with Rosedale Station’s surroundings to the south, caused the City to take a second look. By a vote of 15 to 6, Council resolved to expropriate it for park purposes. What the TTC sold for $31,500 was expected to cost the City $50,000 to get back. See “Vote to Expropriate Lawton Loop,” Globe and Mail, October 22, 1954, 12; “Controllers Throw Out Parks Plan to Expropriate Lawton Loop,” Globe and Mail, October 28, 1954, 5; “Council Division to Delay Action On Lawton Loop,” Globe and Mail, November 2, 1954, 1; “Council Votes 15 to 7 To Buy Lawton Loop For Use as Parkland,” Globe and Mail, November 16, 1954, 1. For more, see James Bow. “A History of the City Streetcars on Yonge Street,” Transit Toronto (last modified: September 7, 2015); James Bow. “The Unsung Changes to the Yonge Subway,” Transit Toronto (last modified: June 25, 2015). The Deer Park Residents Association (DPRA) did not stop with the arrival of the subway, of course. While resigned to that fact, there remained considerable discomfort with the arrival of the apartment buildings and even perhaps offices that were to be part of the deal. By 1956, both 95 and 101 Lawton6101 Lawton, also known as the Lawtonia Apartments, was constructed in 1929 (at the height of another real estate boom) and designed by Douglas Kertland, who was then best known for the CNE’s Automotive Building. had been completed and many more were in the planning stages. In mid-1955, members of the DPRA protested the development of a 10-storey apartment on Mallory Gardens. The complaints were what you would expect to hear, of course: one claimed that the apartment would “destroy neighbourhood amenities”, another complained that it would be a “blot on the landscape and reduce property values.”7”Group Protests New Apartment in Deer Park,” Globe and Mail, June 16, 1955, 7. Later, however, in an interesting twist, the DPRA reversed many of its objections to such projects on Lawton, explaining that it would represent an undue financial hardship to prohibit owners from selling their lots to the highest bidder – expected to be apartment developers.8”Home Owners Reverse Stand, Back Apartments,” Globe and Mail, March 29, 1955, 25. A. Nordheimer, of the DPRA later clarified that the association still had reservations about the march of apartments along Lawton, but decided to let this one go. See A. Nordheimer. 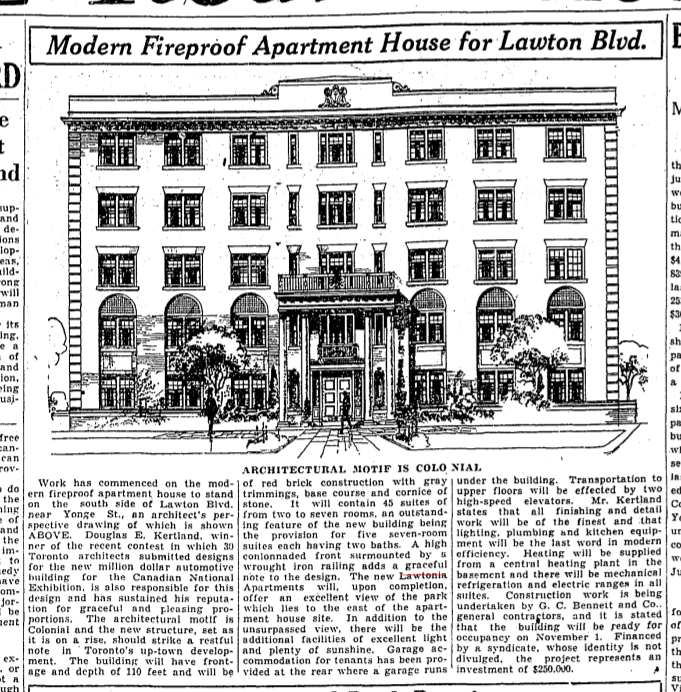 “Apartments on Lawton,” Globe and Mail, April 4, 1956, 6. The march of apartments up Lawton was only the beginning, of course, as Elias Rogers’ cluster development of six towers was later planned for the old coal yard at Lascelles and the Beltline (Brentwood Towers).9”Six Apartments Planned on Coal Yard Site,” Globe and Mail, April 12, 1956, 1. Below are two photographs of the development under construction in 1958 and one shortly after completion. 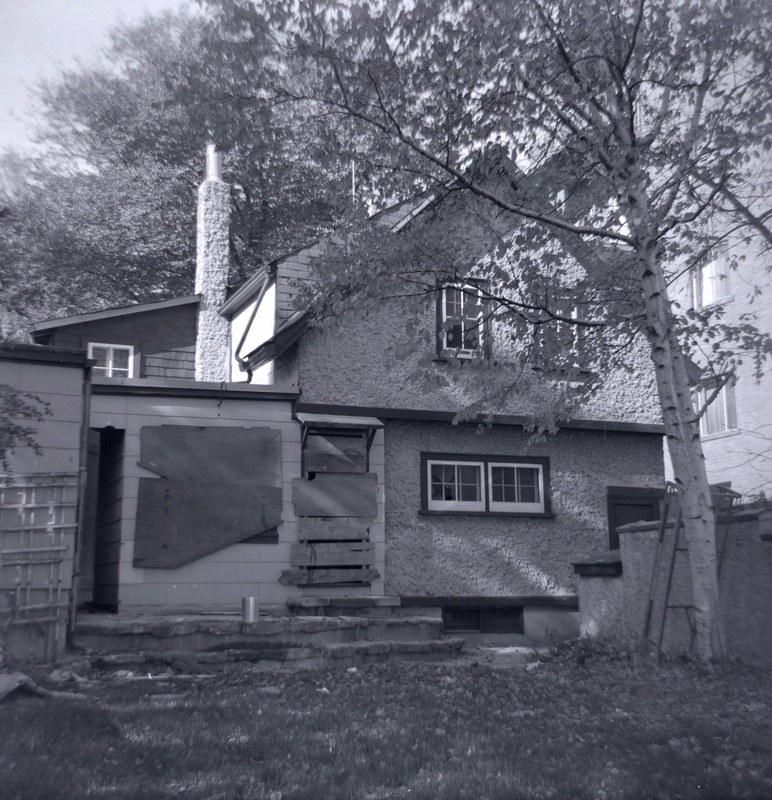 Gail Manor, 95 Lawton’s neighbour to the immediate south, was also constructed in 1958/59, but it came at the cost of Toronto’s then oldest inhabited home at 89 Lawton.10See “Log Cabin Doomed: German Nobleman’s Home, Built in 1802, to be Razed for Apartments,” Globe and Mail, October 15, 1958, 5. 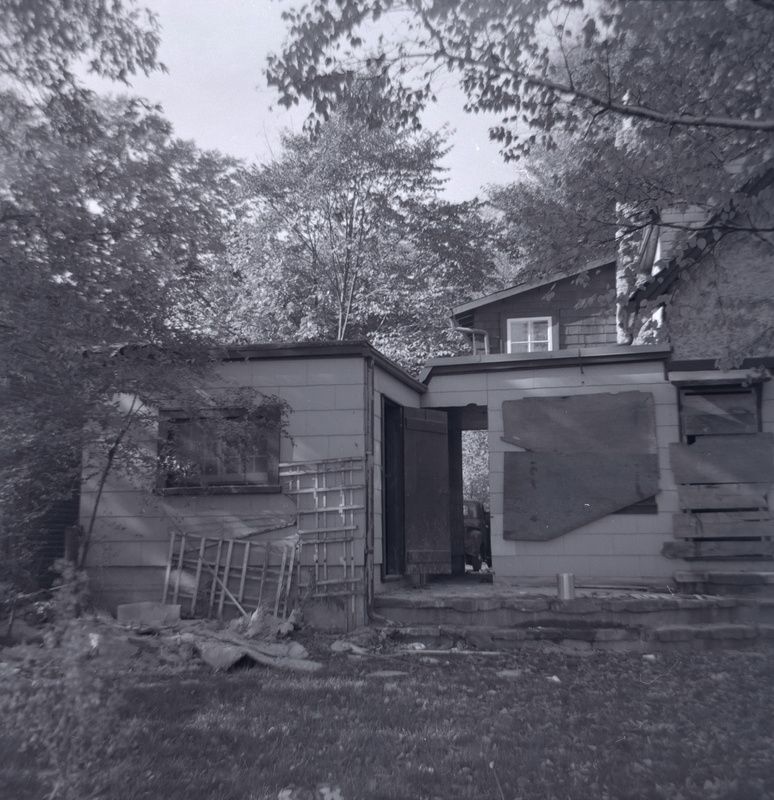 The three photos below depict the home as it was immediately before demolition. The first two are from Lawton and the last, from the rear. 95 Lawton’s balconies are visible to the left of the first picture. Images: Toronto Public Library, Baldwin Collection, Items 958-8-3, 958-8-6, 958-8-7, 958-8-5, 958-8-8. The strip in 1956. The apartments were well on their way. 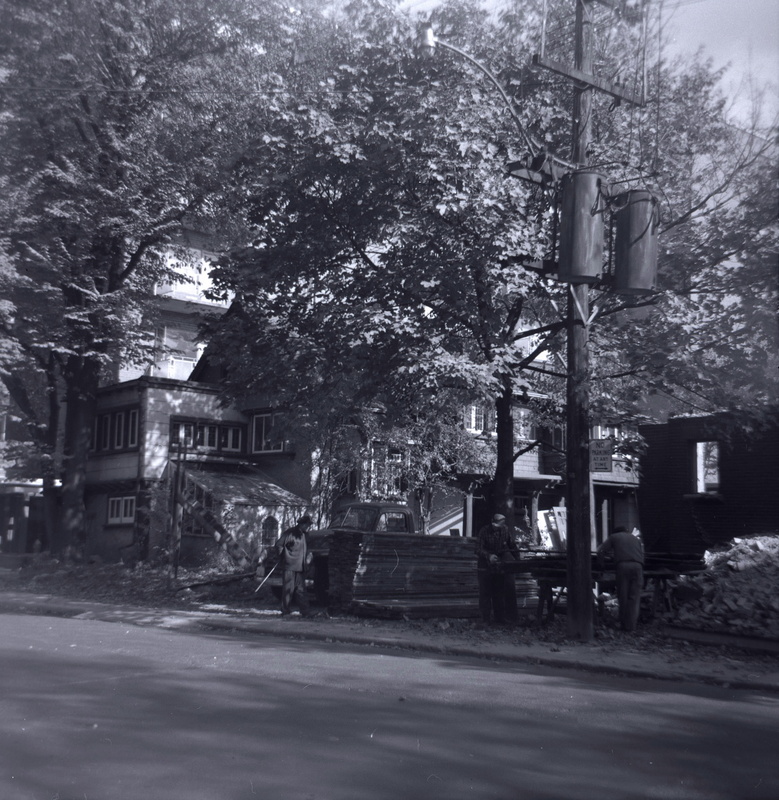 Image: City of Toronto Archives, Series 12, 1956, Item 135. By 1970, it was quite well built out. 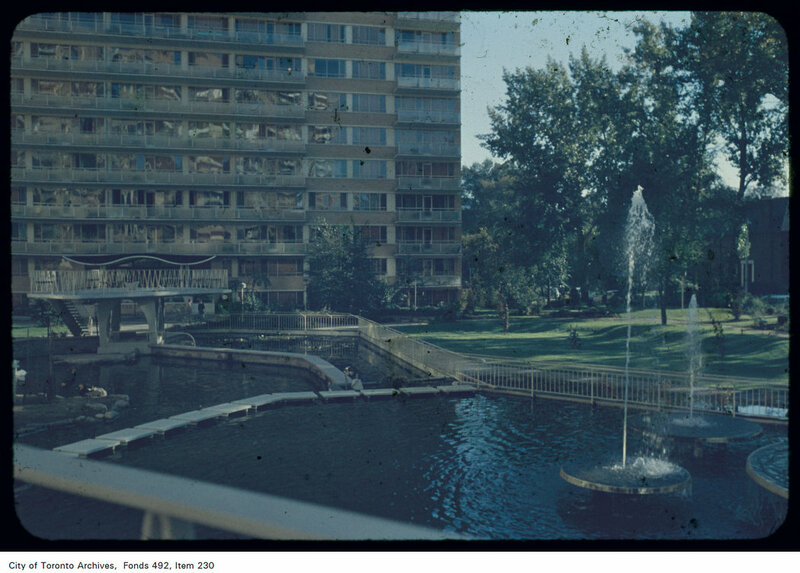 Image: City of Toronto Archives, Series 12, 1970, Item 90. The location was just too convenient. Image: Frank Lennon / Toronto Star / Toronto Public Library, Baldwin Collection, Item TSPA 0109087. As is also the case today, however opposed the surrounding community might have been, the apartments were, but any metric popular and welcome for those who lived in them. Admittedly, my motivations for looking into this building came from a bit less of a happy story and relate to the photograph below. 95 Lawton was the site of tragedy in December 1958. Image: York University Clara Thomas Archives & Special Collections, Toronto Telegram Fonds. On December 24, 1958, Ray Norris, guitarist, manager, and founding member of the Rhythm Pals was visiting friends for a Christmas party. The singer and his wife had just moved to Toronto from Vancouver three months earlier and were getting settled into the city. According to the Globe and Mail, Norris’ wife Marlene had come to the party to meet him after one of her own. Because he was not entirely sober, he called a cab to pick them up and bring them to their home on Beechwood in East York. While waiting for the elevator, the couple got into an argument and Norris tried to lean on a railing, he missed and went through the window (see image above). He landed on the building’s entrance head first and later died of his injuries.11”Fall From Window of Apartment House is Fatal to Guitarist,” Globe and Mail, December 25, 1958, 5. The title? “It Could Have Been A Brilliant Career” by Belle and Sebastian. 1. ↥ Toronto Star, April 7, 1956, 35. 2. ↥ Toronto Star, January 27, 1956, 29; Toronto Star, February 14, 1956, 38; Toronto Star, February 24, 1956, 44. 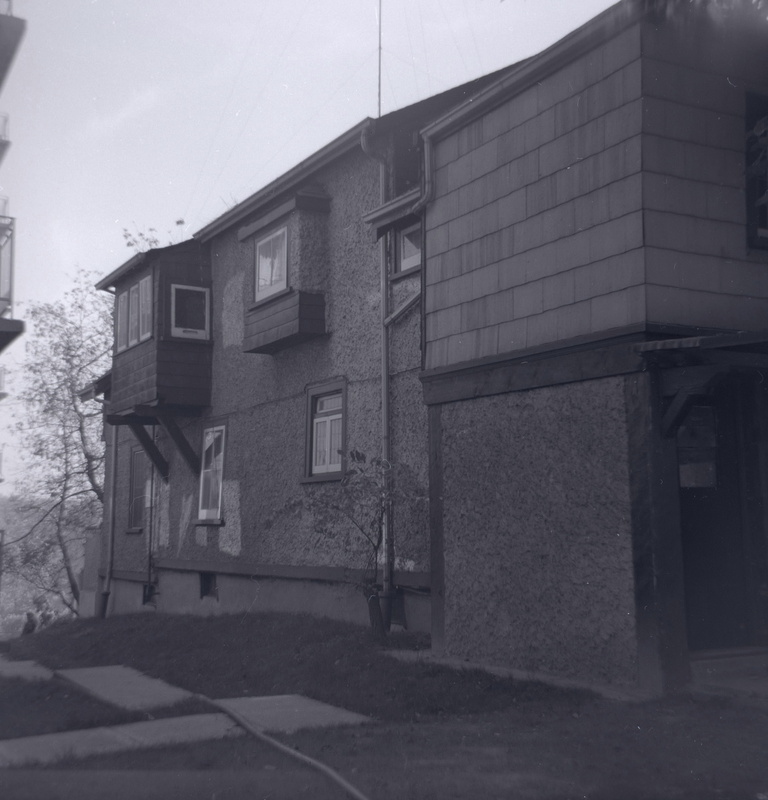 Co-operative apartments were, during the 1950s, a popular way to reconcile the desire for owner-occupied housing with the reality of rapidly increasing property costs. Advertisements for – and discussion surrounding – such cooperative apartments are stunning reminiscent to what surrounds condominiums today. See Globe and Mail, May 21, 1949, 27; “Luxury Planned for Co-operative Apartments,” Globe and Mail, September 27, 1955, 8; “Around Metro,” Globe and Mail, October 20, 1956, 14; “Co-operative Apartments Increase,” Globe and Mail, October 13, 1956, 13; James Knack. 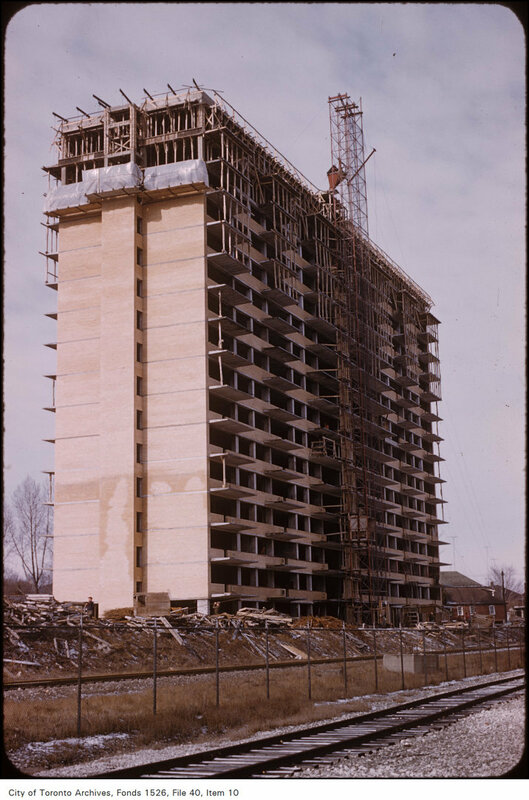 “New Rights in Apartment Use Seen In Co-Operative Housing,” Globe and Mail, July 6, 1957, 12.The first tower condominium constructed in Canada was Horizon House in Nepean. See E.H.Q. Smith. “Old Wine in New Bottles,” Habitat 12, nos. 4-5 (1969): 2-4; John Geisler. “Ontario,” Habitat 12, nos. 4-5 (1969): 6-7. 3. ↥ I am, of course, not in Toronto at the moment so do not have ready access to sources with which I can verify. 4. ↥ A large enough portion of the shard had been used for the subway line’s open cut and had necessitated the demolition of a number of homes, including what was then the city’s oldest inhabited home located at 89 Lawton. See “Rapid Transit Project Dooms Oldest Building,” Globe and Mail, August 9, 1949, 5. The Alexander Muir Gardens were originally on location as well and were subsequently moved to the current location. The two images below are dated 1935 and depict the gardens as they appeared before the subway necessitated its movement. Note the presence of 101 Lawton to the left. 5. ↥ By 1954, the subway had obviated the need for the Yonge streetcar and its associated facilities, including the Lawton Loop. The TTC proceeded to sell the unnecessary facility to Rosedale Properties, a developer who planned to erect a seven-storey office building. Community outcry, as was the case with Rosedale Station’s surroundings to the south, caused the City to take a second look. By a vote of 15 to 6, Council resolved to expropriate it for park purposes. What the TTC sold for $31,500 was expected to cost the City $50,000 to get back. See “Vote to Expropriate Lawton Loop,” Globe and Mail, October 22, 1954, 12; “Controllers Throw Out Parks Plan to Expropriate Lawton Loop,” Globe and Mail, October 28, 1954, 5; “Council Division to Delay Action On Lawton Loop,” Globe and Mail, November 2, 1954, 1; “Council Votes 15 to 7 To Buy Lawton Loop For Use as Parkland,” Globe and Mail, November 16, 1954, 1. For more, see James Bow. “A History of the City Streetcars on Yonge Street,” Transit Toronto (last modified: September 7, 2015); James Bow. “The Unsung Changes to the Yonge Subway,” Transit Toronto (last modified: June 25, 2015). 6. ↥ 101 Lawton, also known as the Lawtonia Apartments, was constructed in 1929 (at the height of another real estate boom) and designed by Douglas Kertland, who was then best known for the CNE’s Automotive Building. 7. ↥ ”Group Protests New Apartment in Deer Park,” Globe and Mail, June 16, 1955, 7. 8. ↥ ”Home Owners Reverse Stand, Back Apartments,” Globe and Mail, March 29, 1955, 25. A. Nordheimer, of the DPRA later clarified that the association still had reservations about the march of apartments along Lawton, but decided to let this one go. See A. Nordheimer. “Apartments on Lawton,” Globe and Mail, April 4, 1956, 6. 9. ↥ ”Six Apartments Planned on Coal Yard Site,” Globe and Mail, April 12, 1956, 1. Below are two photographs of the development under construction in 1958 and one shortly after completion. 10. ↥ See “Log Cabin Doomed: German Nobleman’s Home, Built in 1802, to be Razed for Apartments,” Globe and Mail, October 15, 1958, 5. 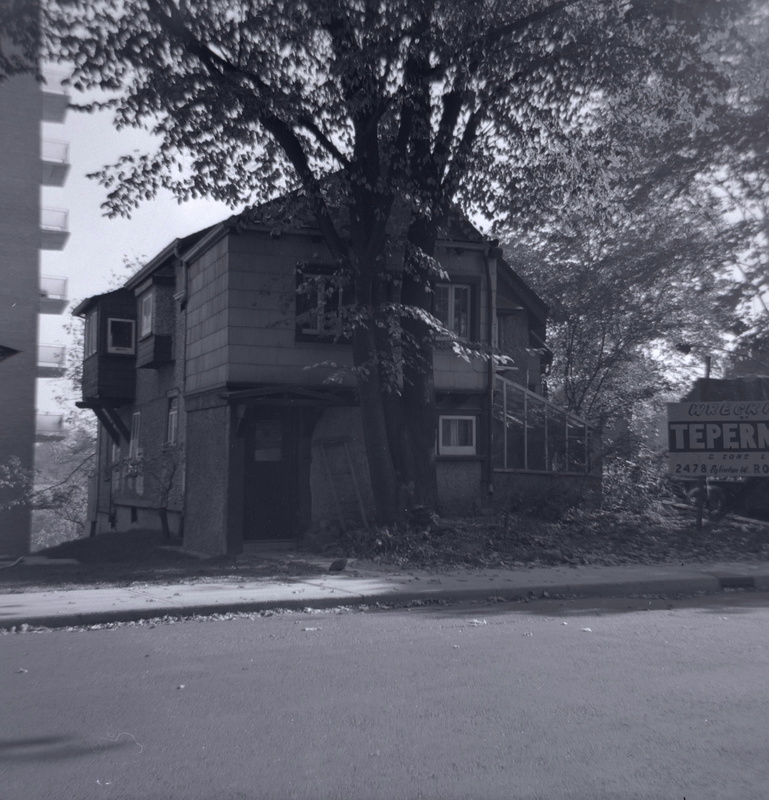 The three photos below depict the home as it was immediately before demolition. The first two are from Lawton and the last, from the rear. 95 Lawton’s balconies are visible to the left of the first picture. Images: Toronto Public Library, Baldwin Collection, Items 958-8-3, 958-8-6, 958-8-7, 958-8-5, 958-8-8. 11. ↥ ”Fall From Window of Apartment House is Fatal to Guitarist,” Globe and Mail, December 25, 1958, 5.